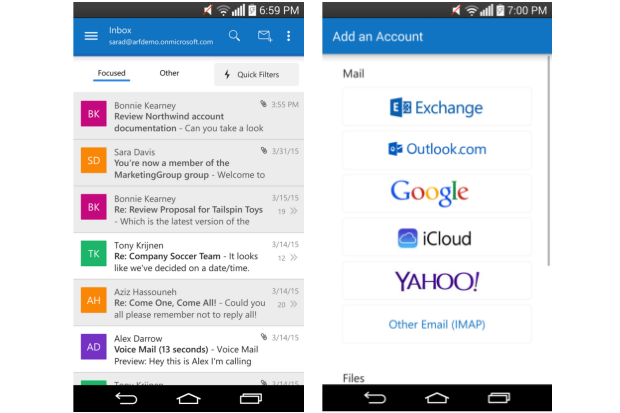 Microsoft’s Outlook app for Android shed its preview tag on Wednesday, three months after Microsoft launched the app in beta form. 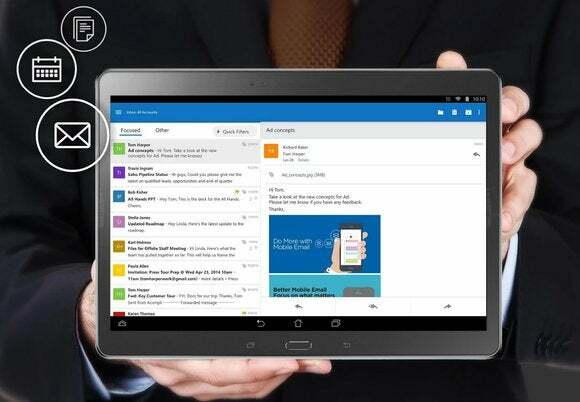 Outlook for Android has received 17 updates in the weeks since, Microsoft said today, fleshing out the app’s functionality. Most notable is the app’s fresh, colorful coat of polish, which maintains that Office feel while simultaneously embracing Android’s overarching design principles. The original Outlook for Android beta app was a colorless, ghastly thing. That’s not the only change, of course. Support for IMAP email and a three-day calendar view for large-screen devices have been added, along with a new directory search feature. The People section was revamped to include a unified view of your contacts, complete with quick options to start an email, call them on the phone, or get directions to a meeting. The ability to customize your swipe gestures and where emails landed when you performed them were added in February. All in all, Outlook for Android’s shaped up nicely over the past few months. You can see a full list of the major changes from the past three months in this Office Blog post. 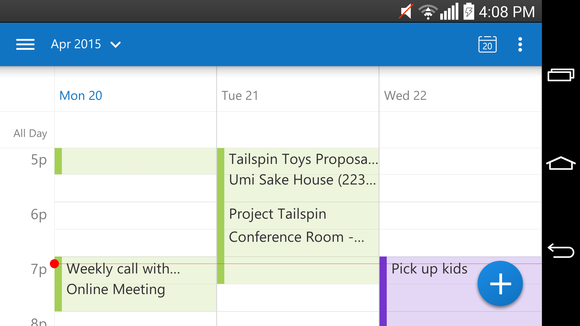 Three day view in Outlook for Android. The story behind the story: The widespread release of Outlook for Android once again drives home the fact that this ain’t your momma’s Microsoft. Under CEO Satya Nadella, the company has adopted a “mobile-first, cloud-first” ethos that has finally freed Microsoft’s various services from the shackles of Windows to thrive on competing platforms. Case in point: Mobile Office apps for Windows 10 won’t even be released in preview form until the end of this month. Those apps have been available on Android and iOS for months now. While the sudden ubiquity of Microsoft’s services steal some of the exclusive luster from Windows and Windows Phone devices, casting the tools far and wide is nothing but a good thing for users—and, given Windows’ miniscule share in the phone and tablet markets, it’s a smart move for Microsoft, too.